FILE - A woman dries bushmeat - which includes animals such as bats, antelopes, squirrels, porcupines or monkeys - along the highway near Yamoussoukro, Ivory Coast, March 29, 2014. Oxford University scientists have developed a map of areas where animals are likely to be infected with the Ebola virus and they say it’s a first step toward predicting where future outbreaks might occur. Scientists said the current Ebola outbreak in West Africa began when a human came into contact with an infected animal, the most likely culprit being a fruit bat. The bat can carry the virus without getting sick. This map, based on a model created by a team led by Oxford University scientists, predicts that in animal populations the Ebola virus is likely to be circulating across a vast swathe of forested Central and West Africa. Dr. Nick Golding, an Oxford University researcher who worked on the international mapping team, said, “The current outbreak of Ebola has really made us realize that it can be a really significant public health threat." He said Ebola has two stages. First, it is transmitted between animals in the wild and can infect humans when they come into contact with those animals. "And then there’s a second spread, which is what we’re seeing in Guinea and other areas of West Africa where it’s transmitted human to human," Golding said. The new map is based on data on where human and animal infections have occurred since the first reported outbreak in 1976. “So the map we’ve put together essentially highlights areas where we think there’s a risk of infected animals being present and therefore there’s a risk to humans,” he said. 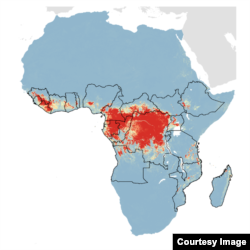 The map shows that “populations of infected animals are likely to be circulating” across a vast area of forests in Central and West Africa. “There’s not a lot of data, unfortunately, on where infected animals are or where humans have been infected in the past," Golding said. "So what we did was environmental pattern matching where we basically identified the environmental characteristics - so, presence of rainforest through satellite imagery and temperature and other factors. And basically matched places which are environmentally similar to those places in which Ebola virus has been found in animals or has been transmitted to humans," he said. The Oxford scientist said the map covers a much larger area than was previously thought to have Ebola infected animals. “For example, in previous maps it wasn’t thought to be present in West Africa, in the site of the current outbreak. The areas that are at highest risk are in Central Africa - around where most of the previous outbreaks have been - in the Democratic Republic of Congo, particularly," he said. "Though the area in Guinea where the current outbreak popped-up is actually very, very environmentally similar. So, that’s actually quite high risk as well," Golding added. About 22 million people live within the countries shown on the map. Golding stressed that despite the current outbreak, Ebola is still a rare disease. Nevertheless, some areas are at greater risk than others. Screening fruit bats in countries where Ebola cases have not been reported could indicate the risk for an outbreak. “In those regions where we think that there’s a risk - and countries in which transmission to humans has been reported - then definitely I think awareness-raising is an important part of strategy to preventing and stopping early these future outbreaks,” Golding said. The Ebola virus has been found in three different species of fruit bats, but scientists have not ruled out other species as potential carriers. Funding for the Oxford study came in part from the Wellcome Trust and the Bill and Melinda Gates Foundation. A report on the research can be found in the online journal eLife.